Performers include: John Cena, Rorke Denver, Noah Galloway, Tawanda Hanible, and Nicholas Irving. This physical competition series stars WWE Superstar John Cena. On the show, 16 of the country’s toughest men and women are split into four teams as they work together to face a variety of military-grade and survival-themed challenges. 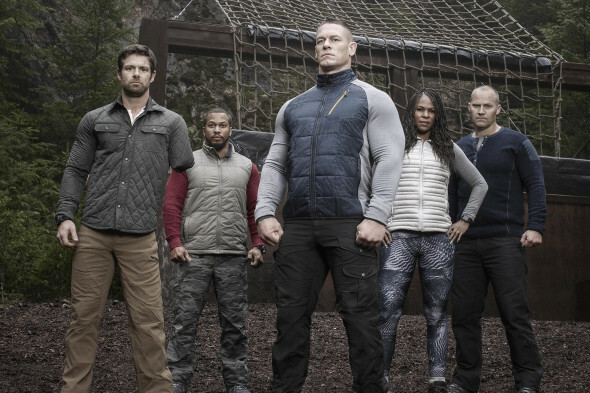 Cena and an elite group of mentors from the nation’s most exclusive military units push these civilians beyond their limits. The mentors, who represent diverse backgrounds and top branches of the US Armed Forces, are known as “The Cadre”. They include Rorke Denver, Noah Galloway, Tawanda “Tee” Hanible and Nick “The Reaper” Irving. These real-life heroes impart their first-hand knowledge and experience to help the competitors work together as teams to surmount near impossible mental and physical challenges. Only the first team to complete the challenges together is safe from elimination. Each episode culminates in “The Circus” — a punishing, endurance-based obstacle course that’s designed to break the weakest competitors. With up to $1,000,000 of prize money at stake for the winning team, this is a serious test of strength, grit, human spirit and, most importantly, teamwork. What do you think? Do you like the American Grit TV show? Do you think it should be cancelled or renewed for another season? i liked the a real lot. i don’t think fox should cancel the show. there are a lot of other shows that should be canceled on fox instead. i can’t think of some right now but there is a lot to me. Please do not cancel this show. This one of the best shows on tv. Omgosh I love this show, and so does my son who is a Captain and CO in the United States Marine Corp.. Hoo Rah Please don’t cancel.. I absolutely loved this show. It kept me interested and watching week to week to see what was going to happen. I sincerely hope to see a second season. loved it. best thing on. I watch this over SmackDown and NBA Playoffs. Absolutely loved it. Cena is great on the show. What I loved the most was that they used our military men and women. Specially the army Sargent. He didn’t let his disability stop him. He still took his team on hikes. I really hope there will be a season 2. If you will continue to have competitors on American Grit like that so called “No excuse mom” who is full of nothing but excuses and whines about everything, then it should be cancelled. I think the show would be better if say, there were family members of actual veterans who have served our nation. Please renew! Love the competition! Very intense! Finally, a showing that allows our veterans to express how proud they/we are of the sacrifices that were made.